Update: After some delays and obstacles, I was finally on Ken O’Keefe’s Middle East Show, albeit as a call-in guest, on Monday, January 13 during the last half-hour of the show. 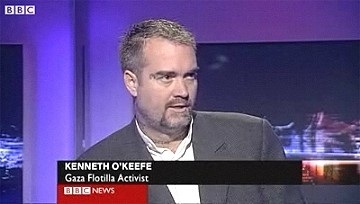 O’Keefe was involved in the humanitarian aid flotilla to Gaza in 2010 in which Israeli forces murdered 9 activists on the Mavi Marmara. Note: Bollyn was unjustly detained at London’s Heathrow airport on arrival on January 11 and deported to Sweden in the early morning hours of January 12. After being held and interrogated for 9 hours, Home Office (UK Border Force) asserted that Bollyn poses a risk to British national security because of misdemeanor convictions stemming from the undercover police assault at the Bollyn home in August 2006. Bollyn is currently investigating the reasons for his detention at Heathrow airport.